Davin Heckman. A Small World: Smart Houses and the Dream of the Perfect Day. Duke University Press, 2008. 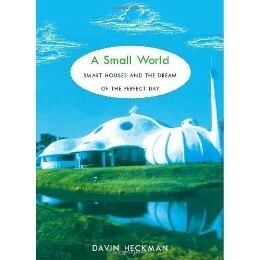 More than anything else, Davin Heckman’s A Small World: Smart Houses and the Dream of the Perfect Day is about the slow disappearance of utopian scenarios concerning everyday life from American culture. As its subtitle suggests, A Small World traces this disappearance through an examination of the idea of the “smart house,” the dwelling that renders life easy, gratifies desires and stands at the crossroads of information. If the family home has become the space of deployment for a wide range of technological innovations, Heckman suggests, it has also served to domesticate technology. The absorption of technology within the home, where it is inserted within the mundane practices of everyday life, has undermined the utopian visions in which technology was once implicated. In his introduction, Heckman dwells at length on the Disney corporation’s Experimental Prototype Community of Tomorrow (EPCOT), conceived in the 1960s on a wave of wildly utopian thinking. I worried, briefly, that the book would join the long list of works waving a demystificatory wand over Disneyesque dreams which had never held much sway over this book’s likely readership anyway. Heckman spends little time on such demystification, however, even nodding favourably at the ambitiously imaginative and large-scale thinking that presided over the original planning of the EPCOT Center. By the time the Center was finally built, of course, in the 1980s, these utopian scenarios had been stripped away and the final result was a consumer playground. Nevertheless, Heckman suggests, residues of these scenarios returned a decade later, as significant motifs in the marketing of the planned community Celebration. In any event, A Small World is less about utopian scenarios for living than about the shrinking of such scenarios within the more banal initiatives that have sought to make everyday domestic life a little less labourious. The “Perfect Day” of Heckman’s subtitle designates the “moderate” scenarios for improved living that have guided home and community design since the 1950s. These scenarios are no longer about living in a radically transformed future. Instead, “the perfect day” is little more than the dream of easy access to consumer goods, home-based entertainment and labour-saving technologies. The post-war ideal of the suburban home, with its family life centred on the television, is perhaps the purest example of this “moderate” scenario. That ideal, Heckman shows, almost imperceptibly edged out more grandiose visions, like those which imagined futuristic cities in the sky or radically new forms of social organization. Home technologies, then, function within what Heckman calls a “technically derived system of associations” (93) that guide and tie together our relationships to consumer goods. Our technological world is no longer a coherently imagined future, but, rather, a diversity of options with which we familiarize ourselves, even as the commodities that embody these options take their place within our lives. Nothing, perhaps, better exemplifies this detachment of technological change from futuristic dreaming than the steady advance of the videophone into our lives, through interfaces like Skype or new versions of the iPhone (introduced subsequent to the publication of Heckman’s book). While the ubiquity of the videophone was once, in science fiction narratives and prophetic visions, the very standard by which futures were judged, it is now sneaking into our daily routines with no great heralding of its arrival nor any clarity about its distinctiveness relative to what came before it. One of Heckman’s strongest arguments is, in fact, relatively tangential to the book’s main focus, though it addresses, like much of A Small World, the withering of utopian thought. The history of modernist design is normally told as the crusade to eliminate ornament from everyday objects, a process intended to “focus the user’s attention . . . on the essence of the object or space at hand” (43). Those who, in the 1970s, traded in their parents’ wood-encased televisions and stereo systems, designed to look like furniture, for stark, metallic component systems whose wiring was exposed might well have imagined themselves casting off the last vestiges of stuffy Victorian duplicity for the honest functionality of the modern world. Perceptively, Heckman traces the ways in which sleek, streamlined design became its own “ornamentation,” a signifier of efficient modernity. This embrace of an instrumental, minimalist look for household technologies signalled both generational change and the Bourdieuian struggle for taste-culture distinctiveness, but it also expressed a new sense of media technologies as controllable, banal features of everyday domestic life. Heckman’s A Small World arrives amidst a flurry of scholarship on portable media and the “mobile internet” – scholarship which risks rendering the notion of the informational home a little musty. Certainly, the interconnectedness of homes in Disney’s Celebration – with its much touted access to email and chat rooms – seems dated, not simply because access to these things is more widely available, but because the home seems less and less like the site in which these amenities are rooted. Even a decade ago, to move into a new house or apartment was to engage oneself immediately in hooking up a landline phone, getting cable installed and setting up the television set as the organizational centre of domestic space. For my students, increasingly, none of these may happen, as the notebook computer becomes the prime medium for audiovisual programming, and a wireless card or G3 signal, acquired through a cell phone subscription, provides access to the signals that carry it. Homes continue to be weighty clusters and crossroads of informational activity, pursued in behaviour that is often sedentary and familial, but the “smartness” whose history Heckman traces seems more and more to pass through the house rather than marking its distinctiveness. If there is a weakness to this engaging and well-meaning book, it stems from the variety of agendas that drive it, which render its different parts distinct in tone and focus. From its opening discussion of Disney’s scenarios for ideal living, Heckman moves into an extended history of the notion of the “smart” home, pursuing this through a useful but slightly distracting examination of the idea of “smartness” in relation to such things as bombs and other features of modern warfare. The final chapter of A Small World is an extended, polemical engagement with the key terms of contemporary political theory, from posthumanism through biopolitics, personhood, and ideas of the multitude. Two of Heckman’s arguments stand out here, for the clarity and intensity with which they are made. Against calls to embrace our posthumanism, he suggests that “we are already becoming posthuman, whether we like it or not” (152), and diagnoses the problem of the present as arising from a scarcity of humanist discourse rather than its stubborn persistence. “[P]osthumanist speculation,” Heckman suggests, “is grounded in a relatively optimistic notion of the present and an unstable and chaotic version of the future – an inversion of traditional utopian models” (153). Faced with this uncertain future, he argues, we are best to insist on an “absolutist regard for human rights” rather than embracing what he identifies, with his theoretical enemies clearly in sight, as the “the transient materialist rights of the bio-political person” (153). In the arguments that conclude this final chapter, Heckman turns to the question of everyday life. Everydayness runs throughout the book, as a motif whose ascendant cultural centrality is taken to signal the waning of utopian vision. The movement of the everyday to the core of cultural theory, in the work of de Certeau and others, has gone hand in hand with the capitalist redesign of our homes as places marked, more than anything else, by the ease with which we may amuse and gratify ourselves within them. The controlled fleshing-out of everydayness, through television programs that elicit our interactivity or new media that mobilize the memory of community, is, for Heckman, the basis of the “Perfect Day” to which our dreams have been reduced. Will Straw is Professor of Communications at McGill University in Montreal. He is the author of Cyanide and Sin: Visualizing Crime in Fifties America, and a co-editor of Circulation and the City: Essays on Urban Culture (McGill-Queen’s University Press, 2010).